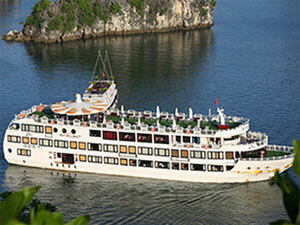 Oriental Sa ils Company will operate a five-star cruiser on Ha Long bay from September 15. Director of Oriental Sails Company Bui Van Chi was quoted by the Communist Party of Vietnam’s online newspaper as saying that that the Starlight Cruise is a big luxury cruiser with 32 cabins, a restaurant, two guest rooms, a library, a massage parlour, a wine cellar and a mini golf on board. Chi said his company will run the vessel in the short term and expects to have five cruises in 2015. During the inaugural month, each visitor will be offered a price of 185 USD for a two-night and one-day tour, and then the price will be raised to 215 USD.